Most Americans inadvertently keep expired medication in their medicine cabinets. In fact, surveys indicate that the average length of time an American holds on to unused prescription medication is three years – that’s 1,095 days that it could pose a danger to you, members of your household and visitors to your home. While research has shown that up to 90 percent of prescription drugs tested were found to be safe for a period of time after their expiration dates, do you know which ones are not? For example, there are studies which indicate the commonly prescribed drug tetracycline may possibly degrade to the point of becoming toxic to kidneys. The medications you take, alone or in combination with others, are usually well monitored by your physician and pharmacist. Randomly taking old medications may be contraindicated with drugs you are currently taking and neither your physician nor pharmacist will know you are taking the expired drugs at the same time. Additionally, your medical condition may change over time, making certain medicines inappropriate for you. Once expired, the chemical compounds in medications are capable of changing color, odor and texture. Chemical properties can also break down causing an unintended effect on your body. Though this is a rare occurrence, it is not worth the risk of consuming an expired medication. The fact that most people store their medicines in a bathroom cabinet can contribute to accelerating the degradation of these drugs from heat and moisture. 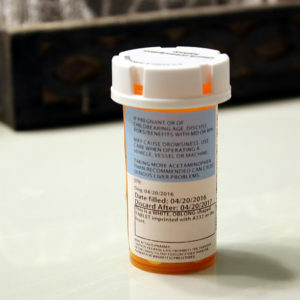 In the bathroom, your medicines can be become less potent or expire before the set date. Even if the expired drugs themselves aren’t poisonous, saving these medications is a bad practice for many reasons. Taking leftover and expired antibiotics the next time you feel sick can actually worsen your condition if you are infected with different bacteria. You could also cause the bacteria to become stronger and drug-resistant if you don’t take a full course of the antibiotic as directed by your doctor. Lastly, storing leftover and expired prescription medications offers a tempting treasure-trove for potential misuse and diversion. Although the current crisis of opioid abuse is in the spotlight, these are not the only drugs which are targets for theft and potential addiction. Anti-anxiety drugs, anti-depressants, stimulants and even prescription-strength antihistamines have both street value and addictive properties and should be properly disposed of as soon as you no longer require the medication. You can act now to make your home, and yourself, safer by using DisposeRx packets to quickly and easily get rid of your leftover medications. See a simple demonstration video of how it works here. A simple graphic can also be found here. Retailers such as Walmart, Rite Aid and Kroger and payors such as Humana are distributing DisposeRx packets with opioid prescriptions to encourage proper drug disposal the moment the medications are no longer in use. If you are interested in getting DisposeRx packets for removing any leftover medications you may have, click here to order directly. Additionally, DisposeRx is eager to work with nonprofits, community groups, schools, faith-based organizations and others to spread the message of addiction and drug misuse prevention through proper drug disposal. To learn more about our programs, contact DisposeRx and one of our representatives will reach out to you within five business days. DisposeRx – solving the problem of safe drug disposal.